In the early 1990s, there was a relatively short-lived scene that journalists christened "shoegazing", due to the performers' habit of staring at their feet (or, more likely, their guitar pedals) rather than interacting with the crowd. I've mentioned many times on this blog that genre names can be unhelpful but shoegazing is an exception. I can easily define the sound and name the associated bands. 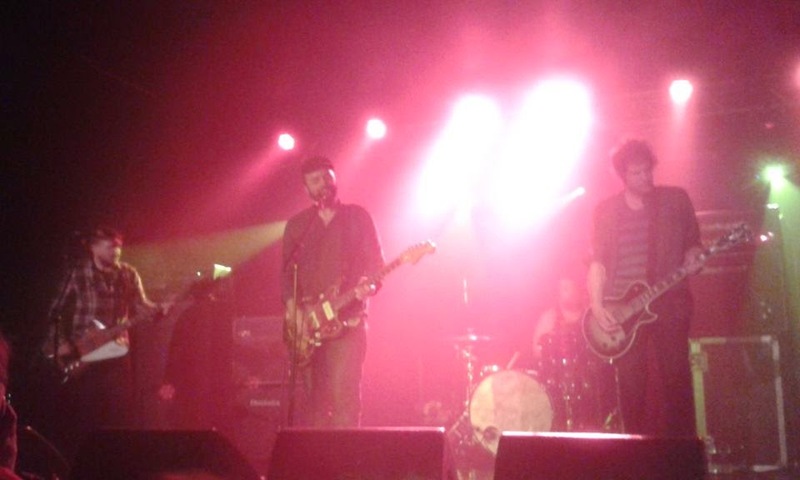 They may not have been at the time but retrospectively, Oxford's Swervedriver are frequently mentioned alongside other acts who were part of the shoegaze culture. However, I'm not sure that this classification is entirely accurate. Although they used distortion and reverb effects, Swervedriver resided at the heavier end of the scale, and were more at home with US contemporaries such as Dinosaur Jr. Rather than hiding behind floppy fringes, they sported dreadlocks and they eschewed the ethereal lyrics of other shoegazers in favour of a road movie theme with pickup trucks and classic cars. 17 years since their last album, they are back and although the approach has matured, much of the intensity and lyrical themes remain. With the dreads gone, Adam Franklin could still be in an American film but with his cap and beard he now resembles a trucker, driving with a defined aim rather than for pure adrenalin. The songs from new album "I Wasn't Born To Lose You" take the sound that had started to develop on 1998's "99th Dream" and push it a little closer to classic shoegazing, with the chiming guitars calling to mind fellow Oxford band Ride. The songs are still about travel but there is a new-found desire to take in the scenery. We are clearly revisiting old haunts - the lyrics of "Everso" slip in a sly reference to classic single "Son of Mustang Ford" - but now the focus is on more than just getting the maximum power out of their engines. Tonight's opening number "Autodidact" talks of "a dimension of beauty mobilised within my head". I like to think that this blog follows similar lines - rediscovering loud records of the past but finding previously unnoticed subtleties beneath the volume. The subtleties are apparent tonight because the sound is spot on. I've recently complained about the acoustics in certain local venues, but I find that smaller gigs often have better sound quality; with the crowd closer to the stage there is no pressure to crank everything up to 11. A powerful experience can still be achieved without sacrificing intricacy and as we stand by the speakers tonight, striking distinctions can be heard between each band member's contribution. Unlike many shoegaze acts, Adam's vocals are clear and the interplay between the fuzzy layers of guitar and more complex elements can be made out in a way that I would only expect when listening through headphones. The problem with Friday night gigs is that they are often poorly attended as everyone prefers to head straight to the pub. Personally I prefer to be at a show that's not sold out, as I can get can close to the stage and even take a few photos without being crushed. But it's hard not to feel for an artist playing to a room not even half full. Swervedriver seem unfazed by this, though, as do the appreciative few who have shown up tonight. Of particular note is the chap in front of me with a lumberjack shirt over his Sonic Youth "Goo" t-shirt, flailing his long hair to old favourites such as "Rave Down" (with its gas station hell and "sharp hard hit of a car crash in a dream"), "For Seeking Heat" ("...a blur of beauty, intoxicating"), and of course "Son Of Mustang Ford" ("hallucinogen headlamps, my sane scape's disrupted in a pickup truck"). As much as the music itself, the presence of this one fan fills me with nostalgia. He doesn't want to forget the past, and why should any of us? Even if we have expanded our viewpoint beyond sheer speed, let's go out with one final blast of power. The evening closes with 1993 single "Duel", and its opening line "You've been away for so long, you can't ask why." Rather than ask why, let's just embrace this welcome return. As I leave clutching a beautiful splatter vinyl copy of "I Wasn't Born To Lose You", my one regret is that I hadn't bought the record sooner. Even before I've unwrapped it, on the strength of tonight's show I am certain it will be one of the top albums of 2015.